First let me tell you that about a dozen of the finest looking floors we have ever installed were a very high quality unfinished and sanded on site (also known as site finished) engineered floor system. Most were nailed over plywood sub floors with a few glued down over concrete. Some species include white oak, red oak and one of the finest black walnut's I have ever seen that was installed in a Troy bank building. We just finished some very extensive water damage repairs in a home In Grosse Pointe, that was formerly built by the Hudsons family of the department store chain. This was the oldest engineered floor I have ever seen, and the widest quartered White Oak too. I couldn't find a company who could make it, so I had to manufacture the stuff myself to make the job work. The engineered unfinished we use is of the highest quality to be found. The wear layer is just about as thick as real 3/4 inch solid hardwood. They can be refinished five to six times without hitting the nails or staples they were installed with. There are some slightly lower cost unfinished engineered product we can get that have enough of a wear layer to refinish two to three times. 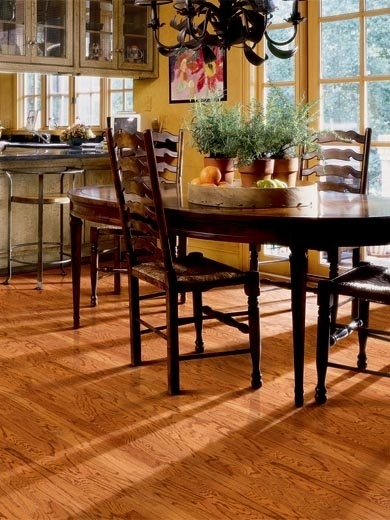 Some of the big box stores Like Lowes, Home Depot, and Liquid Lumbertaters sell products that give engineered flooring a bad rap, Most of the time it's a cheesy Chinese product. They are pushing engineered that's 3/8 of an inch thick with a paper thin wear layer that can not even be screened and coated, let alone resanded and finished once. They claim they can be stapled down and they actually can be, but after a few seasons they pop, creek, crack and raise all kinds of hell because they lose their grip with the sub floor. When glued down and your floor has seen it's last days and you want to change them out, get out your check book. I have torn out these floors that were stuck so good that pieces of the plywood sub floor would come up with the flooring. Now you're replacing your sub floor, which means more money. Don't let me scare you away from prefinished engineered. We do have product available that can be sanded 2 or 3 times for a new shine or color change. The newer high tech floor milling machines are so good in fact they make square edge prefinished products now. Most of the flooring from the past have always had to have a bevel added to the edge of the flooring because the machining wasn't up to par with the standards we have today. A lot of the engineered still has the bevel on the edge and that normally means less expensive. But most bevels are called a micro bevel; being so small it poses no cleaning issues like the dirt catcher grand canyon bevels of yesteryear. The veneer that is the actual surface of the material can be cut in 2 different ways. The first way is to slice it just like you would slice up a log for solid flooring, and the other way is rotary peeled, where the log turns against knives that peel off the wood like pulling toilet paper from the roll. The peeling method is used for the thinner veneers as well as the slice method but there is a hugedifference in the face grain appearance between the two. 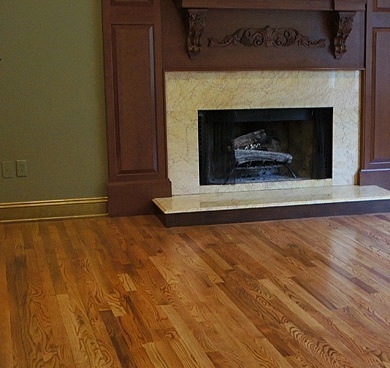 With oak flooring the slice method will look like any other piece of common flat sawn floor. The peel method will have some of the wildest grain patterns, almost to wild for even my taste, and if you have read any of this web site you know my taste is for the wild and unusual. 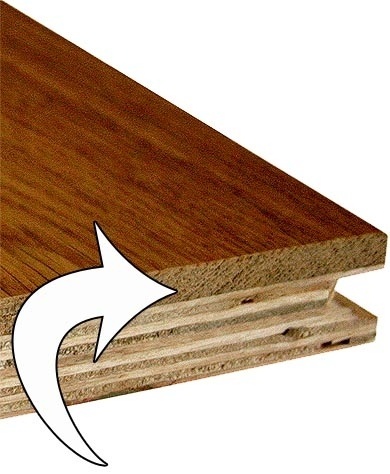 Engineered Flooring - Construction with wear or veneer layer. Shown is a higher quality product that can be refinished 5-6 times. Common Rotary Peeled - Above manufactured by Columbia hardwood. Solid Sawn Engineered - This is a sanded and finished product.